We have divided them in several groups as per their “weight category”. The booster ideally fits a small apartment or an office as its coverage area is limited to 130 m2. Nikrans LCD-130 is beyond all doubt the sales hit among the GSM booster range. It ideally fits a small apartment or an office as its coverage area is limited to 130 m2. In spite of the fact that it supports only one frequency, i.e. 900MHz, and may seem not that functional like more sophisticated signal boosters from the other product lines but it’s to remember that 900Mhz is mostly used by the European operators for transmitting not only GSM but in the majority of locations even 3G signal. Thus, in certain cases our buyers from France, Italy, Spain, Sweden, Finland and others may kill two birds with one stone – to achieve outstanding quality of voice calls and 3G. Surely, that is not applicable for everybody and in each and single case it is advisable to check the frequencies in area and it could happen that such a simple model is able to spare you of the concerns to amplify the mobile phone signal for both GSM and 3 Internet. No frills, but efficient for maintaining GSM and, if applicable, 3G signals at perfectly high level. Another model to mention in this paragraph and the one that has deserved customers’ attention as well is Nikrans NS-150. 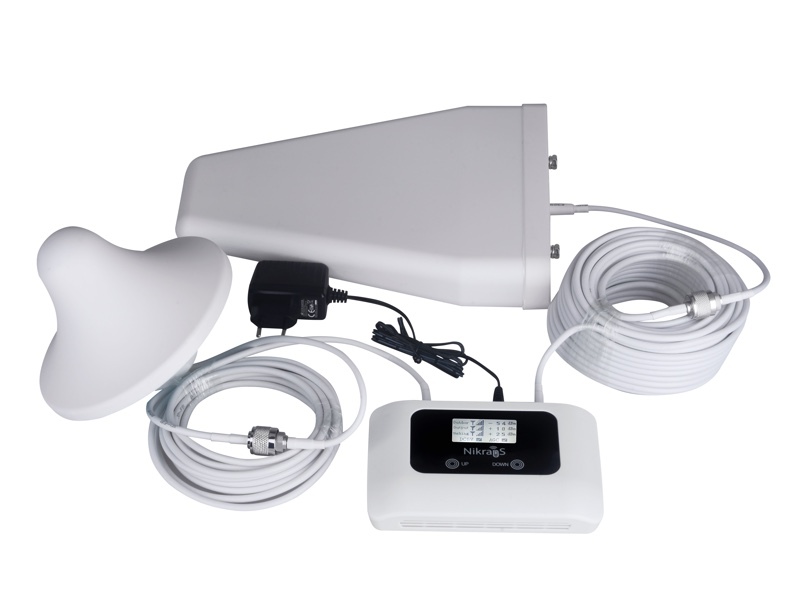 It pursues the same purposes as the previous model, s.s. works at 900MHz, but slightly differs from it in technical characteristics – this GSM signal booster provides higher signal gain and the amplified signal reaches to a bigger area. However, the model occupies the second place in our list and it can be partly explained by the absence of an LCD screen which is for sure very handy when it comes to installation and monitoring the errors or signal strength readings. No frills, but efficient for maintaining GSM and, if applicable, 3G signals at perfectly high level. Good price-performance ratio, if 4G signal is to be amplified. As in the case with the previous models Nikrans LCD-150D allows to fill two needs with one deed. 1800 Mhz is considered as an additional GSM frequency though for some mobile services providers it is the only one in use (for example, for EE in the United Kingdom). Moreover, this frequency is oftentimes exploited for transmitting 4G signal in certain areas. LCD-150D becomes thus a rational option, if a customer possesses a relatively modest, in terms of size, place of residence or work, has an opportunity to capture 4g signal at 1800Mhz and thus fully enjoy his/her mobile phone bundles. 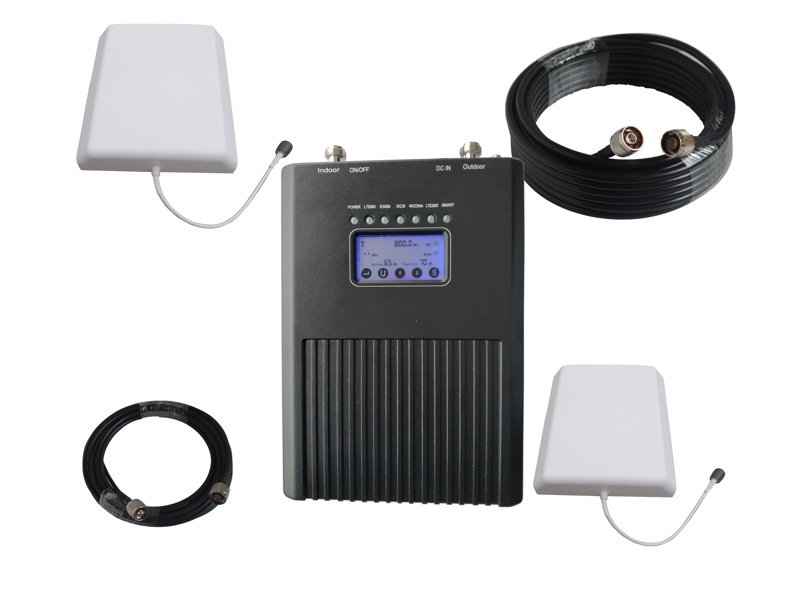 It should be noted that the mobile signal booster LCD-150D gives its users a considerable signal gain – uplink/downlink gain of 60dB/65dB respectively compared to 50 dB /55 dB of NS-150 and 40/50dB of LCD-130. In our opinion, its third place here is due to the fact that 1800 Mhz remains an auxiliary frequency and is rarer in occurrence. The model can be multi-purpose, i.e. in certain localities will enhance GSM, 3G and 4G signals. We consider the cell booster for home LCD-300GD as our best-seller in this category. This can be explained by several significant factors. Firstly, LCD-300GD is a dual band repeater programmed to operate at both 900 and 1800 Mhz. 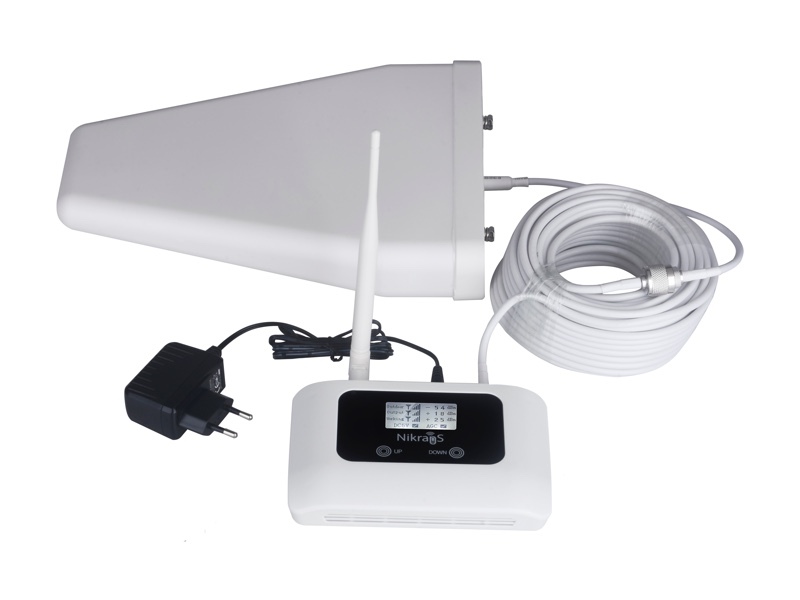 Thus, it is suitable for amplifying GSM signal of all European providers without exception. Secondly, this signal repeater may enhance 3G signal at the supported 900 Mhz and even 4G at 1800MHz. So if the stars align and all three signals are transmitted at these very frequencies in your area (and we observe that it happens rather often), the device will be a valuable tool in the fight against a weak cell signal. Thirdly, LCD-300GD provides a substantial uplink/ downlink gain of 67 / 72 dBm. Moreover, the equipment isn’t bulky and can even be used in relatively small premises. Top pick among 4G signal boosters. The top mobile signal boosters for medium-sized buildings in our rating include LCD250-GSM+4G. The booster is favoured by our customers for the ability to support GSM calls and 4G Internet at the same time. As the 4G technology is spreading up at an incredibly high pace, it is sound practice to have a device that would work with it. Thus, this dual band booster permits its users to gain a considerable amelioration of the voice communications and Internet based applications. 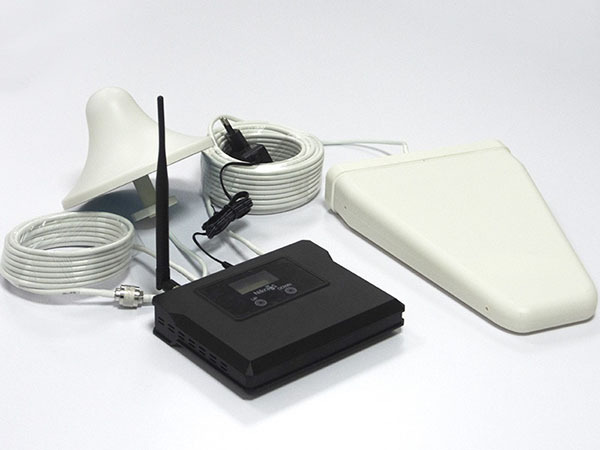 Budget option for amplifying GSM calls in medium-sized premises. GSM amplifier LCD-300 belongs to our basic models that operate only at one frequency. However, its popularity isn’t dropping down with time. The booster model fits ideally for the purpose of improving the signal at 900 Mhz. As it was mentioned before, this frequency is quite multi-faceted — it is not only the “preferable” GSM frequency of the European operators, but is often in use for 3G transmitting. The LCD-300 amplifier caters for surfaces up to 300 m2 but can be a good option for much smaller dwellings should the latter possess massive old style walls (such houses can be seen a lot in the countryside) or be constructed with the materials preventing signal from penetration inside. In these cases, a more powerful model with coverage exceeding considerably your house surface will be more advisable. One of the best performers for areas reaching 500 m2. 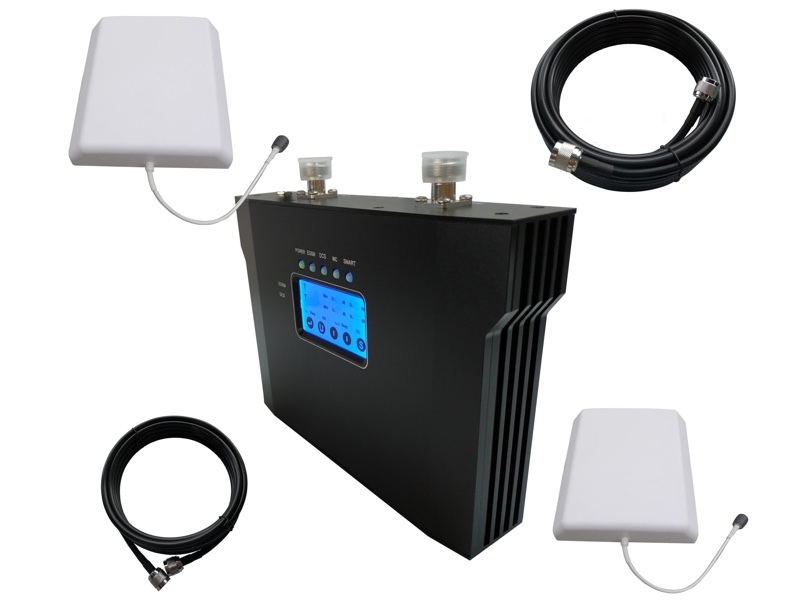 Home Cell Phone Booster Nikrans LCD-500 GD is similar in its characteristics to our best-selling model LCD-300GD and as a consequence is apt to provide its users with an amplified GSM signal no matter which European provider the user is subscribed to, as well as to pick up poor 3G and 4G signals broadcast at 900 and 1800 Mhz respectively. Compared to its acolyte LCD-500GD covers much more square meters and is often chosen for private houses with two floors or work spaces. Fantastic boosting system for larger buildings. 4G Booster LCD1200-GSM+4G is mainly picked up for relatively big buildings with several floors. The signal repeater may be connected with several indoor antennas to guarantee a uniform distribution of the enhanced signal on all the floors of the building. 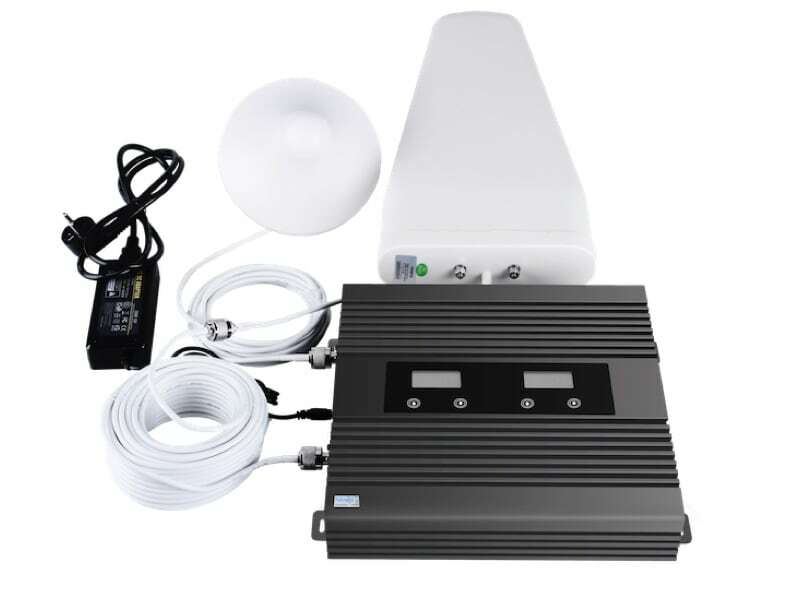 This cell signal repeater is interesting for a customer not only due to its coverage area but also to the combination of the frequencies supported — 900 Mhz and 800 or 2600 Mhz, the last two being in high use for 4G transmitting. Therefore, LCD1200-GSM+4G suits the buyers looking for powerful cell signal boosting systems at an affordable price. Great coverage and great gain. Like all GD series Nikrans NS-5000GD possesses all the technical advantages peculiar to these models and stated above. NS-5000GD will appeal to those of our customers who search for signal problem solution for industrial premises or business buildings of a large surface — up to 5000 m2. The possibility to connect additional antennas together with gain of 75 dBm give excellent results in terms of signal amplification. Universal model supporting all European operators with a substantial coverage. Finally, the list wouldn’t be complete without this awesome five band signal booster NS-2000EDWLL. Thanks to the support of five different frequencies (800, 900, 1800, 2100, 2600 MHz) the signal booster will adapt to any European provider and their frequencies for GSM, 3G and 4G/LTE. Moreover, the model was designed to cover up to 2000 m2 that makes it pretty much a universal model for the citizen of Europe and even in some parts of Asia. It will be a panacea for businesses where the staff is subscribed to different operators or that deal with a flow of customers and thus need their booster to amplify as many signal types and carriers as possible. For sure this top does not detract from the merits of our other series. All of them have found their customers and are intended to cope with cell signal amplification based on the required criteria (operator, signal type, coverage). It should be mentioned that the market of mobile signal boosters is flooded with a multifold of signal boosting devices but we can highlight some most reliable players like Wilson, HiBoost, Ubersignal. MyAmplifiers stands in the same line and we are happy that our competition makes us push forward, constantly search for new features, invent and produce. Surely the choice is up to the customer — from our side we can only strive for perfection in performance of our signal boosters and our service.